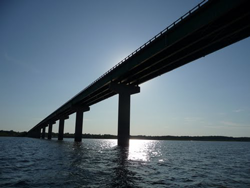 After a high wind even on January 24, 2006, the Des Moines Register reported that the Saylorville Reservoir bridge was observed swaying “at least two, probably three feet each way.” At least five other people claimed to have seen or felt the superstructure moving that day as well. On February 5, 2006, staff from the Iowa DOT and Iowa State University inspected the bridge and found no signs of excessive bridge movement. Bridge Engineering Center staff will install a data collection system that will monitor wind speed and direction and provide notification to Iowa DOT staff when preset thresholds (furnished by the Iowa DOT) have been reached.